I haven't done a Day to Night post in a while so I thought it would be fun to do another. 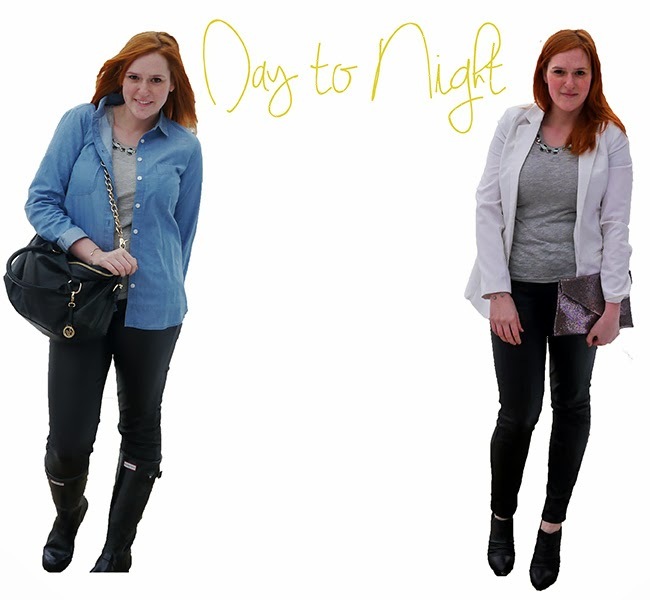 Usually when I have plans after work, I either don't want to find a new outfit or I don't have time to change, so I try to find outfits that can quickly transition from day to night with a few small changes. I wore this last week from work to what I didn't realize was a dinner to celebrate my birthday at Chicago Firehouse with Jeff's dad. Chicago Firehouse is famous for steaks, but my dad had made some amazing steaks for us a couple days before, so instead we went all in on seafood - shrimp, crab, oysters, lobster, and some fantastic seared scallops. And then I rolled home. I 100% need a white blazer. You look great in this one! I really like how you transitioned your top! That white blazer is gorgeous! Both of these looks are cute! I do the same thing, mostly because I get lazy and also because I don't want to double my laundry contribution that day. Love seeing that loft tee in person! Thanks, it was a great find. Ooo yes you should get one. I don't wear it super regularly but when I find the right outfit for it it's one of my favorite pieces. I would get it too but I'm moving in 1 week, I have no idea how long it will be before I have an address. I already shut down my German post office box!